Welcome to the Reprint Registry! This occasional feature documents the reprints of Goodman Games products. Collectors often ask us for detailed printing specs on our many reprinted titles, especially the DCC line. Over the years, some of our out-of-print titles have commanded impressive sums on the secondary market. We’ve been told it is helpful for collectors to have some background on the titles they are collecting or selling. Some dedicated fans collect all the various printings of their favorite adventures. 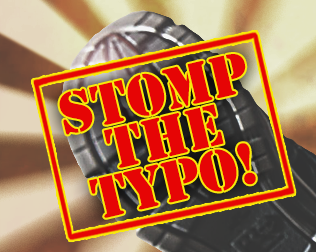 With each new printing of a book, we typically do a fresh editorial review to catch any remaining typographical errors. We often add new content or interior art of some kind. And we occasionally commission entirely new cover art. And some editions or printings that are just hard to find. Some cover variants were originally released only for a certain convention or as a pre-order bonus item. Other titles have been translated into foreign languages, and the diehard collectors want to find every version including the translations. The Reprint Registry will provide some answers on these topics. Up until now, often the only way to get an exact answer was to pin down Joseph Goodman and see what he remembers. In the Reprint Registry, we will start writing down the details for all the fans to read. At least, as well as Joseph can remember! In some cases we didn’t keep as clean records as we should have, so there may be some vague answers, or even areas where we ask you, the fans, for additional help. As part of compiling this feature, we’ve also sound some inconsistencies in our own internal numbering of editions. D’oh! We’ll do the best we can! And now that we have this feature, perhaps future printings will be more ordered. 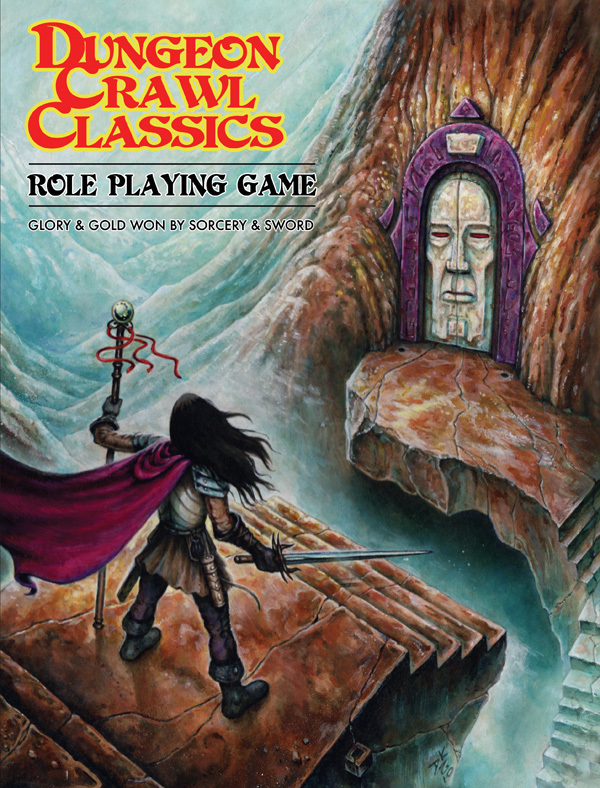 This first installment of the Reprint Registry covers the Dungeon Crawl Classics core rulebook. Here are all the printings, their covers, and the particularities of each. There have been five printings of the hardcover edition, and three printings of the softcover edition. Each printing had multiple cover variations. In some cases, the cover variations in turn had differentiating factors (such as gilded edges, or no gilded edges). 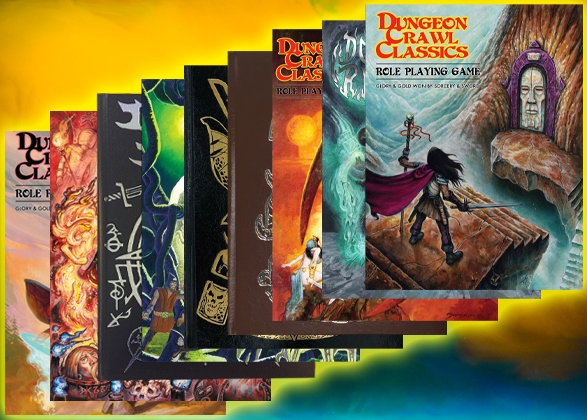 Taken together, there are 23 variations on the DCC RPG core rulebook in hardcover format, across all the different printings, covers and variations. There are 4 variations on the softcover format. And that’s just the English language editions. For the truly dedicated fans, you can also try to track down the 6 cover variations in Spanish and Portuguese. 1st hardcover printing, “blue” cover. Printed 2012, cover art by Doug Kovacs. Distinguished by absence of any printing notation in the banners on the title page (page 2). This printing was offered for pre-order and also distributed to stores, and it quickly sold out. 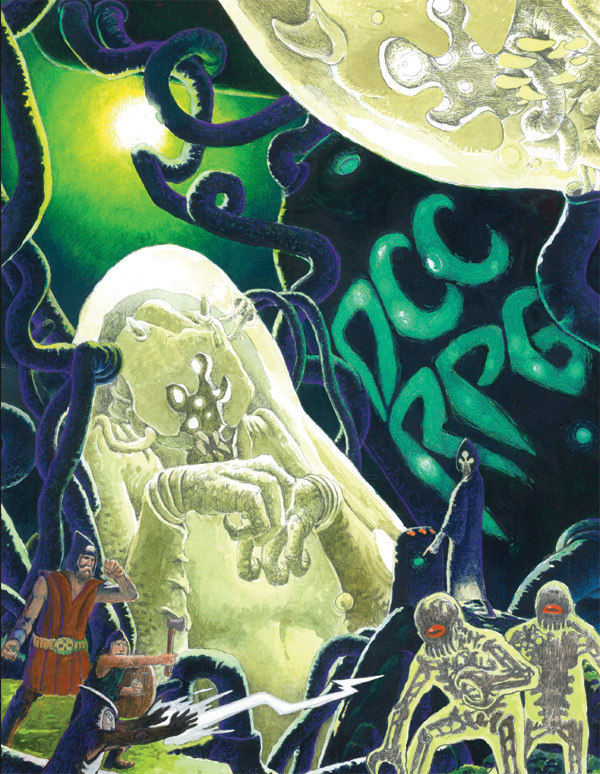 It is worth noting that the 1st printing came packaged with a copy of DCC #66.5: Doom of the Savage Kings. 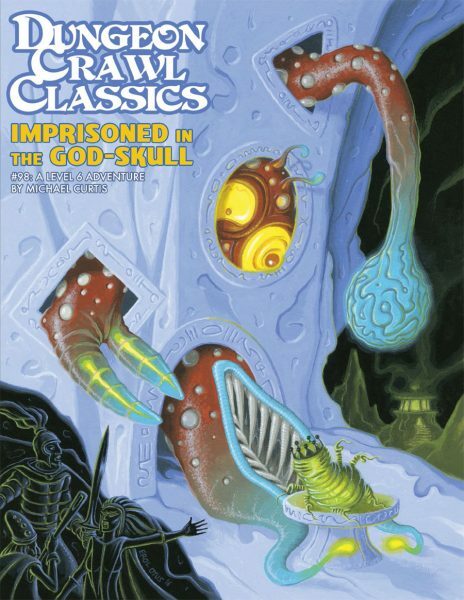 The module was inserted inside the cover of the core rulebook, and was free with purchase of the core rulebook (both in stores and via online pre-order). 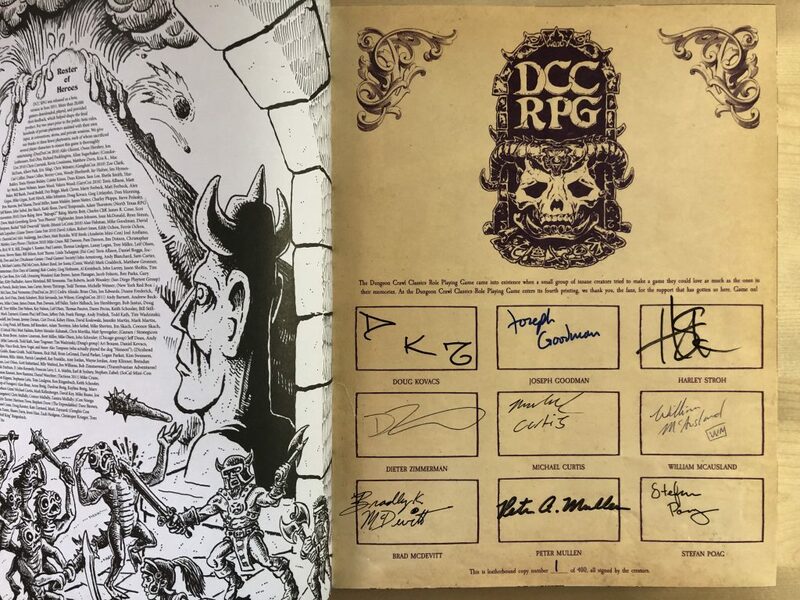 The first printing of DCC #66.5 is quite hard to find; it is the version with the green-and-white DCC logo, and a price indicator of “FREE with DCC RPG purchase, $9.99 otherwise.” A truly mint copy of the 1st printing of DCC RPG would also include a 1st printing of DCC #66.5 tucked inside the cover. 1st hardcover printing, Demon Skull cover. Printed 2012, cover art by Doug Kovacs. This is a gold foil imprint on black leatherette material. This version was produced in limited quantities. Almost the entire print run was sold via direct pre-order, with a small remaining portion selling into distribution before it sold out. 2nd hardcover printing, “blue” cover. Printed 2012. Distinguished by the “2nd printing” indicator in the banners on the title page (page 2). Some typographical fixes, and includes an index, which was omitted from the 1st printing. In general, the last 12-16 pages of the core book change out with every printing, as we update ads and reference material. This is the first time you can see that happen, and it continues with every printing. 2nd hardcover printing, “wizard cover.” Printed 2012, cover art by Doug Kovacs. Includes the same text as the 2nd printing “blue” cover. Every copy of the wizard cover originally shipped with a Stefan Poag art folio booger-glued inside the cover, so a truly mint copy will include this art folio. This limited run was available for about six months before it sold out. 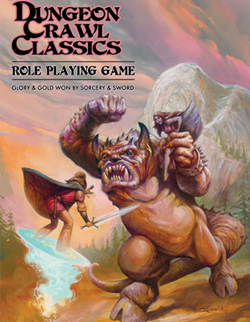 2nd hardcover printing, “Jeff Easley” cover. 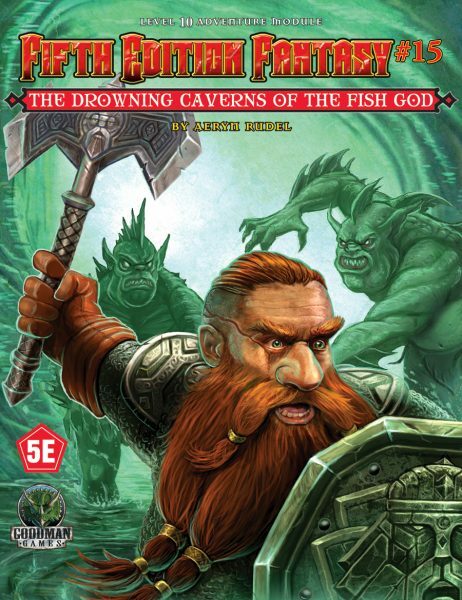 Printed 2012, cover art by Jeff Easley. Includes the same text as the 2nd printing “blue” cover. Every copy of the Jeff Easley cover originally shipped with a Brad McDevitt art folio booger-glued inside the cover, so a truly mint copy will include this art folio. Also available for only a short time before it sold out. 3rd hardcover printing, “blue” cover. Printed 2013. Distinguished by the “3rd printing” indicator in the banners on the title page (page 2) as well as on the back cover above the bar code. It also has red headbands on the spine (as opposed to the black headbands on first two printings). Text includes a few minor typographical corrections. This is the same version that was also available packaged in the first “yellow” slipcover edition. The 4th printing came in two versions. All versions have sewn-in satin ribbon bookmarks, while the Kickstarter edition also has gilded page edges and thumb tabs. The Kickstarter edition also came wrapped in a dust jacket, which states “Kickstarter 4th printing edition” on the back. All editions of this printing have “wings” in the back – fold out cardstock panels with quick reference tables. 4th hardcover printing, Peter Mullen cover. Printed 2017, cover art by Peter Mullen. All text identical to 4th printing, as noted above. The Peter Mullen cover print came in three versions. One version was “normal.” The Kickstarter version had gilded page edges and thumb tabs. 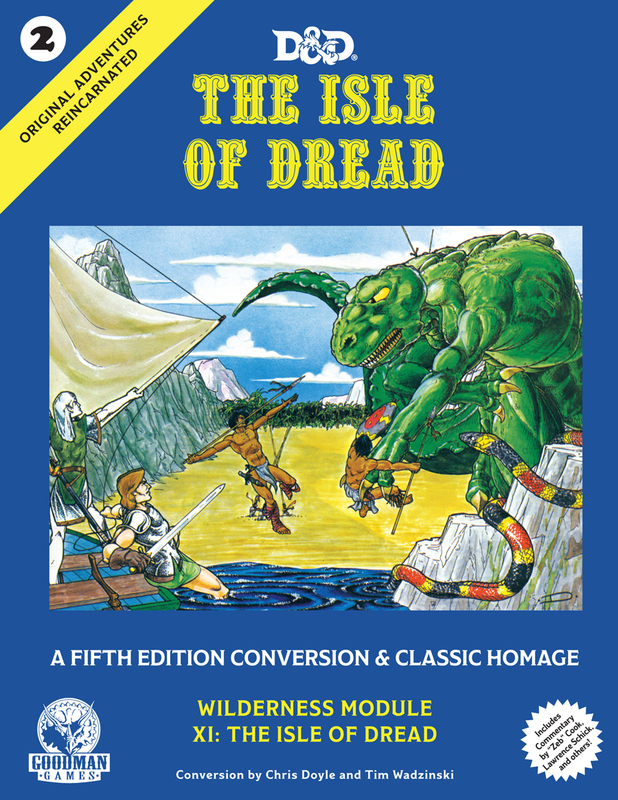 The Kickstarter edition also came wrapped in a dust jacket, which had the “blue” cover art even though it enclosed the Peter Mullen cover edition. Finally, a third version had the normal distribution version packaged in a new “orange” slipcase design. 4th hardcover printing, silver foil cover. Printed 2017, cover art by Doug Kovacs. 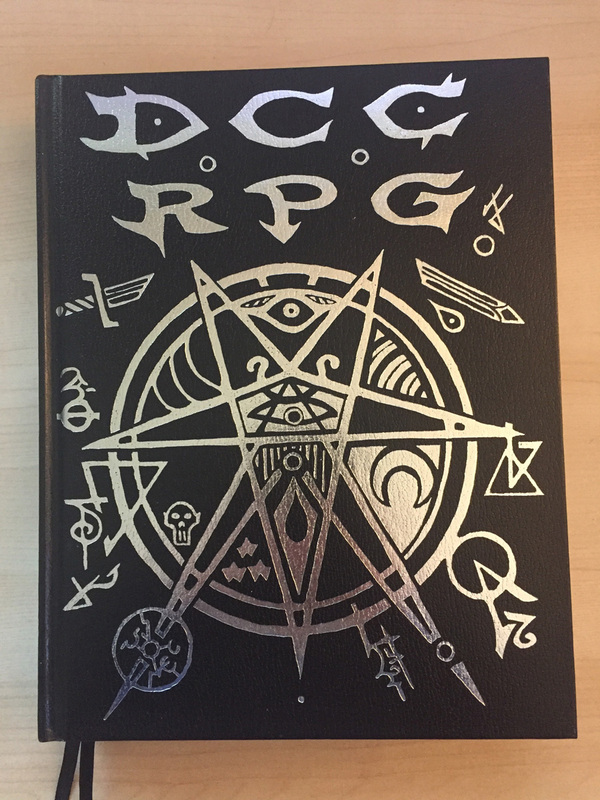 This edition has the seven-pointed star of Sezrekan on the cover, and is meant to aesthetically complement the original demon skull edition. All text identical to 4th printing, as noted above. This cover print came in two versions. The distribution version was “normal.” The Kickstarter version had silvered page edges and thumb tabs. The Kickstarter edition also came wrapped in a dust jacket, which had the “blue” cover art even though it enclosed the silver foil cover edition. 4th hardcover printing, real leather cover. Printed 2017, cover art by Doug Kovacs. This edition is bound in a real leather. It has the seven-pointed star of Sezrekan on the cover, with some variations in the art from the silver foil edition. Look at the two images side by side, and the differences are clear. All text is identical to 4th printing, as noted above. This cover print came in two versions. The Kickstarter version had silvered page edges and thumb tabs. 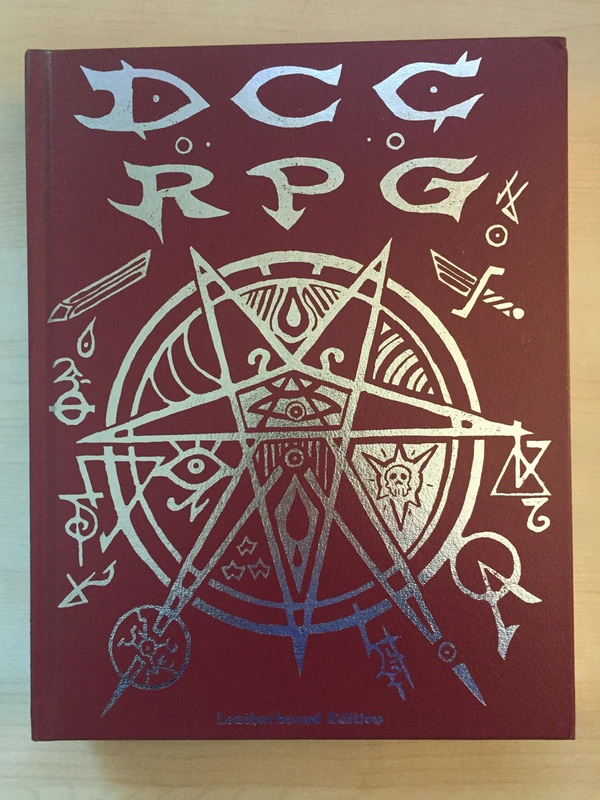 The Kickstarter edition also came wrapped in a dust jacket, which had the “blue” cover art even though it enclosed the silver foil cover edition. Finally, the Kickstarter edition came with a very special insert: a bookplate tipped inside between pages 4 and 5, which was signed by nine (yes, nine!) 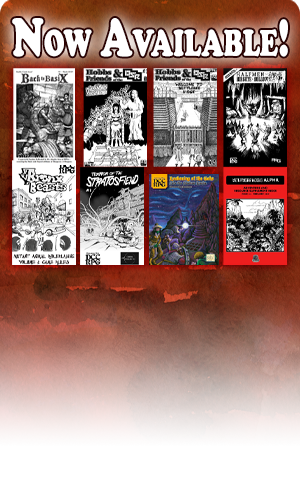 of the DCC RPG contributors: Joseph Goodman, Doug Kovacs, Harley Stroh, Michael Curtis, Stefan Poag, Peter Mullen, Brad McDevitt, Dieter Zimmerman, and William McAusland. There was also a different version of the leather edition released for distribution sale. This version lacked the book plate, silvered edges, thumb tabs, and dust jacket. 5th hardcover printing (also known as 7th printing), “blue” cover. Printed 2019. This 5th printing of the hardcover is called the 7th printing because there were 4 hardcover and 2 softcover printings prior to it. 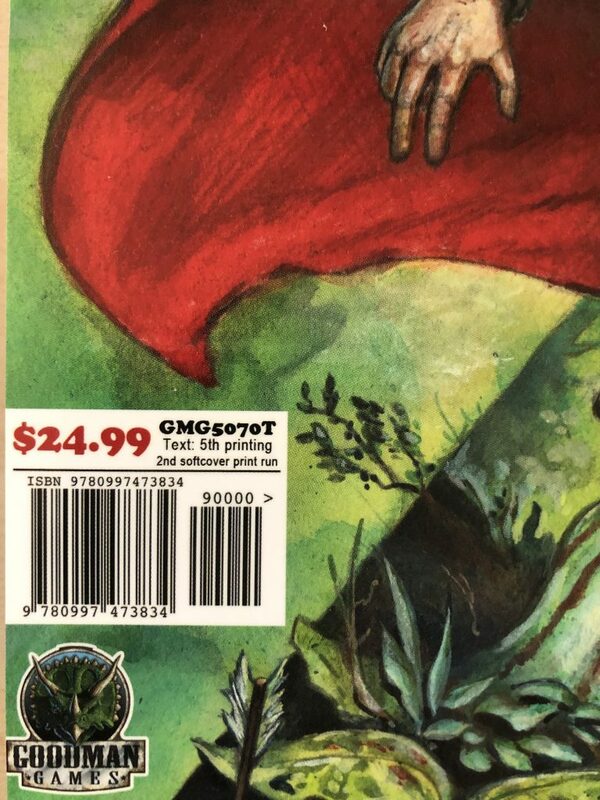 The back cover says 7th printing above the bar code, while the banners on the title page (page 2) say 5th printing to reflect that it’s the 5th hardcover edition. (Confusing? Yes. Should have done this index before we reprinted it!) The text of this printing was updated to include a new adventure in the back, Yddgrrl’s Maze, which replaces The Abbott of the Woods. 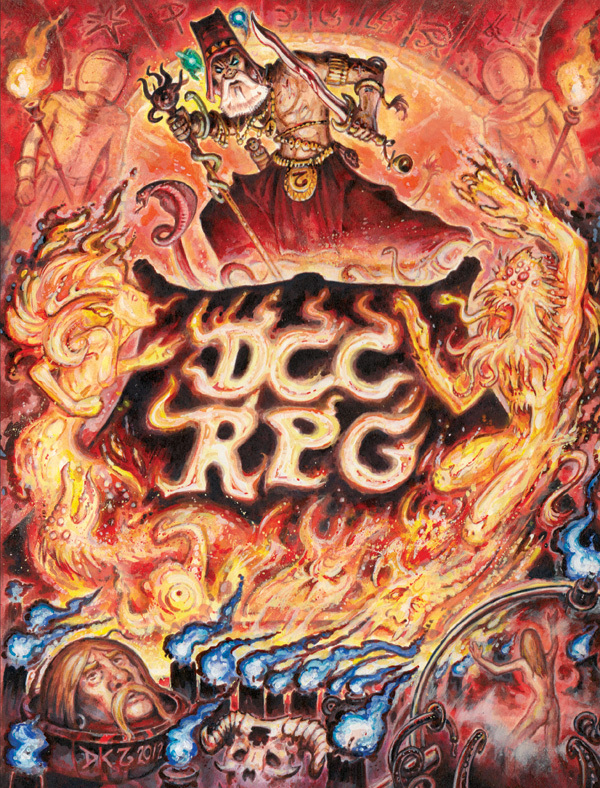 The “wings” were removed from the back, but the text was expanded to include 16 pages of additional “fun stuff” at the back, including the quick reference tables, ads for the artists’ web sites, convention photos, an updated list of adventures available for DCC RPG, and other such things. 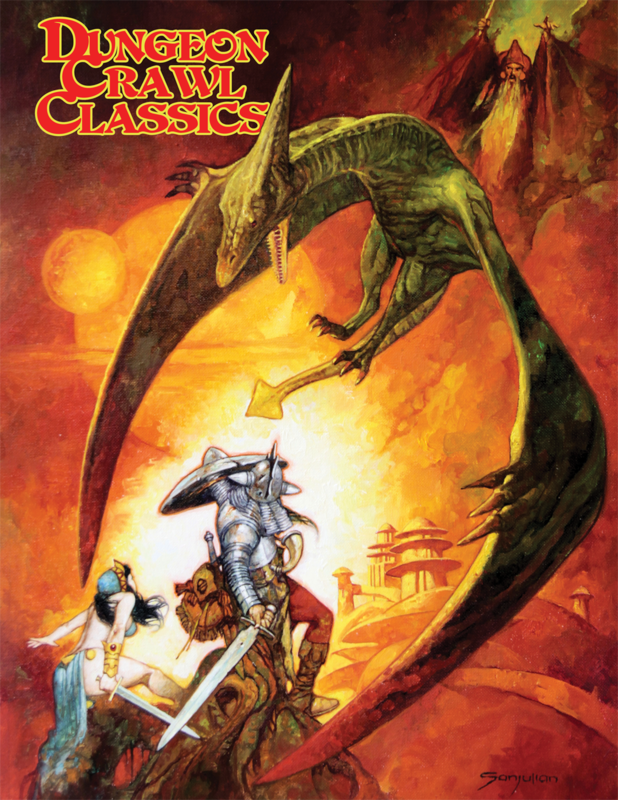 5th hardcover printing (also known as 7th printing), Sanjulian edition. 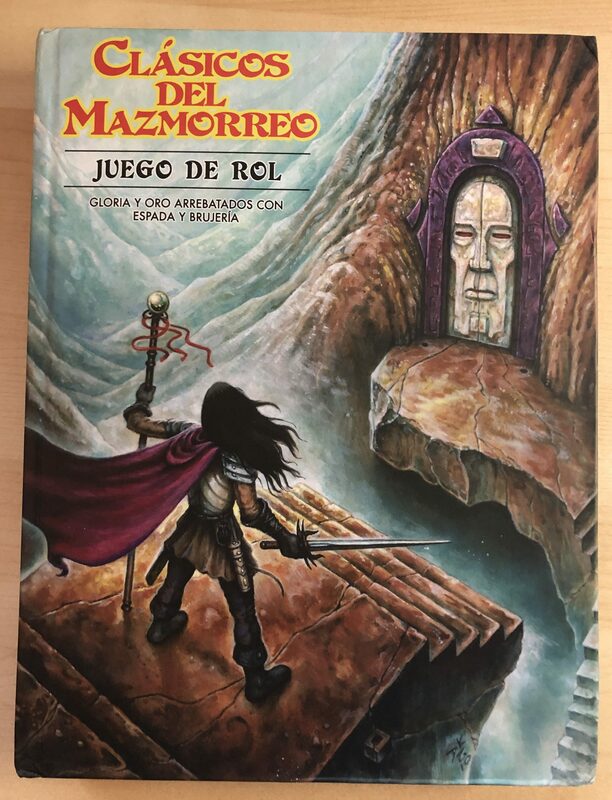 Printed 2019, cover art by Sanjulian. 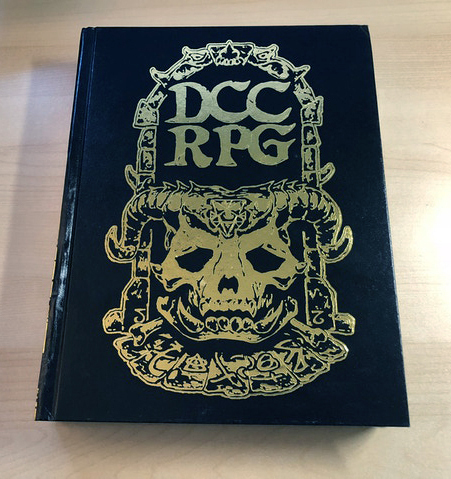 There are two versions of this cover: one has red foil over the DCC logo and was sent to Kickstarter backers, while the other has no foil at that location and was distributed to stores. 5th hardcover printing (also known as 7th printing), “Shanna Dahaka” edition. Printed 2019, cover art by Doug Kovacs. 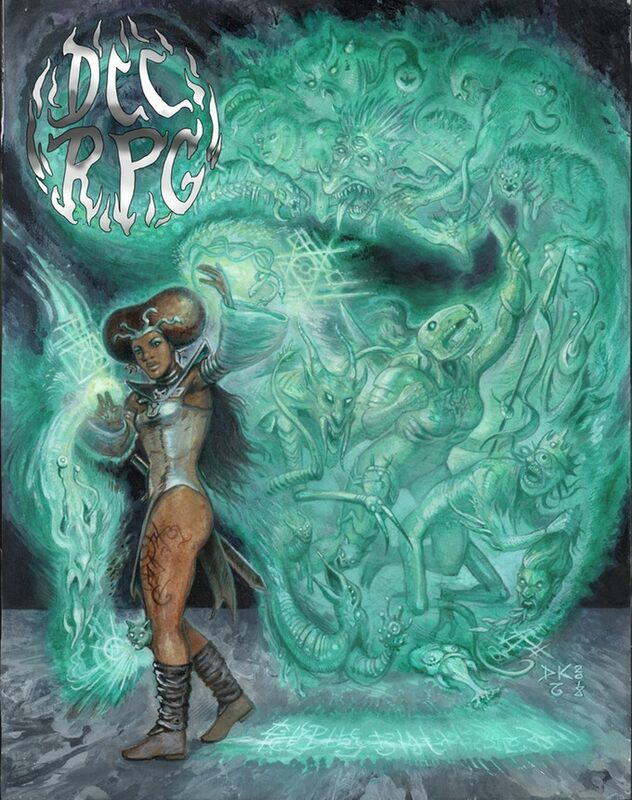 This version has a new painting by Doug depicting the magic of Shanna Dahaka, with a painted foil DCC RPG logo. 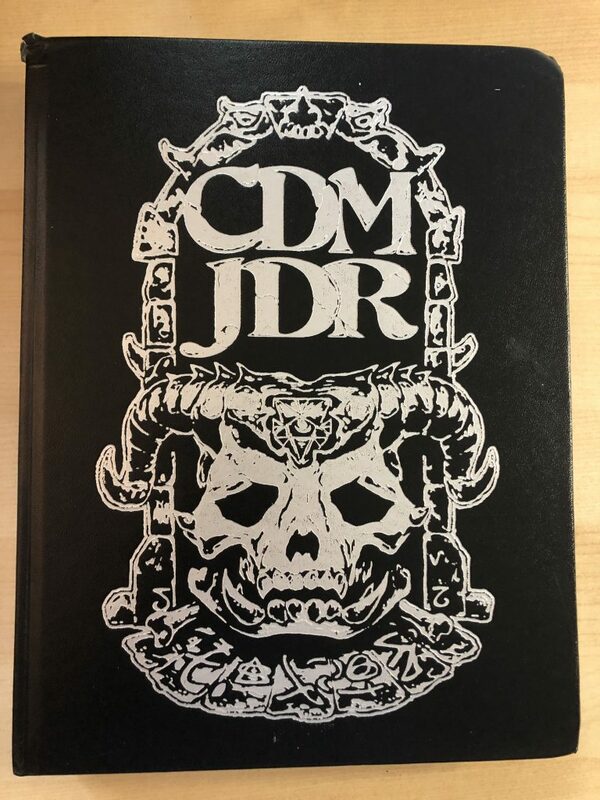 5th hardcover printing (also known as 7th printing), demon skull redux, silver foil. Printed 2019, cover art by Doug Kovacs. This version brings back the popular demon skull image, this time in silver foil on a brown leatherette cover. This version was distributed to stores. 5th hardcover printing (also known as 7th printing), demon skull redux, gold foil. Printed 2019, cover art by Doug Kovacs. This version brings back the popular demon skull image, this time in gold foil on a brown leatherette cover. This version was sent to Kickstarter backers. 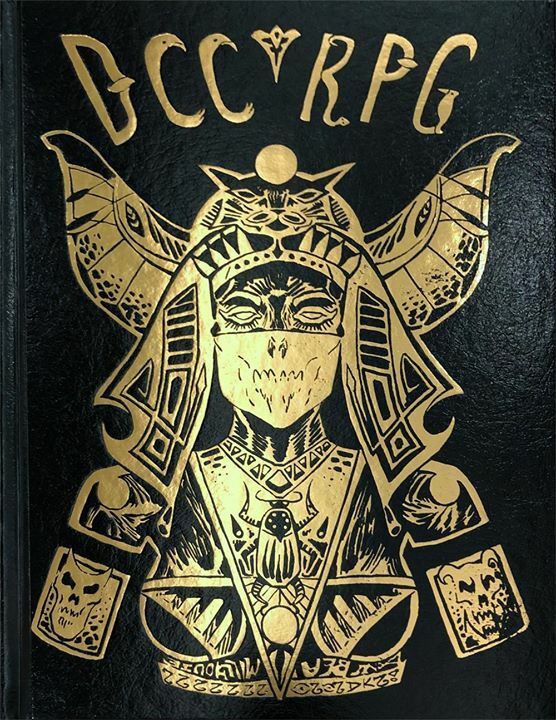 5th hardcover printing (also known as 7th printing), Egyptian Lich cover. Printed 2019, cover art by Doug Kovacs. This limited edition uses some of Doug’s awesome art, and is designed to complement the original demon skull edition. The Egyptian lich is thematically related to the “Egyptian Guy” who is the mascot of the 2019 road crew. This edition was available only at conventions, or to participants in the road crew. 1st softcover printing, “blue” cover. Printed 2016. This was originally printed as a stopgap until the hardcover was back in print, but it proved to be quite popular so the softcover edition has remained available. The text of this edition is the same as the text of the 4th hardcover printing. Above the bar code on the back cover is the phrase, “Text: 4th printing.” As a result, the banners on page 2 read “4th printing” even though this is the 1st printing of the softcover. 2nd softcover printing, “blue” cover. Printed 2017. The softcover edition proved to be very popular so when the first print run sold out, it was reprinted and kept in print. This second softcover printing can be distinguished by the back cover, which reads “Text: 5th printing, 2nd softcover print run” above the bar code. The text of this edition is the same as the text of the 4th hardcover printing, but the banners on page 2 read “5th printing.” Which in retrospect is really confusing! Oh well. This version includes the adventure The Abbott of the Woods. 2nd softcover printing, “wizard” cover. Printed 2017. 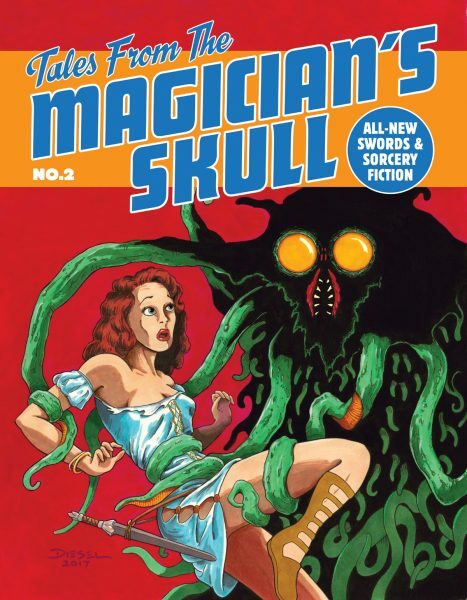 The text of this edition is the same as the 4th hardcover printing and 2nd softcover printing, but the cover is updated to use the “wizard cover” art. 3rd softcover printing, “blue” cover. Printed in 2019. This softcover edition was reprinted alongside the 5th hardcover printing and has the same interior text as that edition. This third softcover printing can be distinguished by the back cover, which reads “Text: 7th printing” above the bar code. The title page with flags reads 5th printing, and in this case it actually matches the 5th printing of the hardcover. As such, the text actually changes between this 3rd printing and the previous 2nd printing. 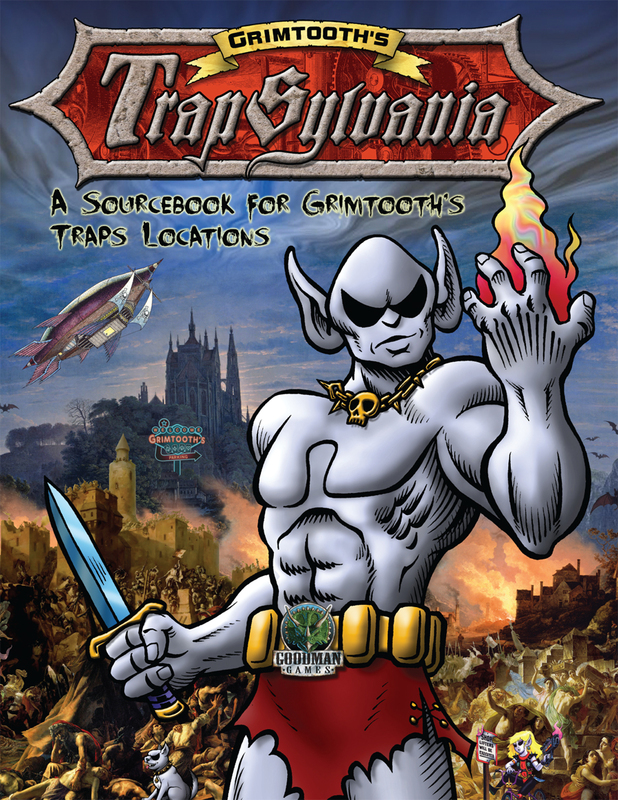 This version includes the new adventure, Yddgrrl’s Maze. 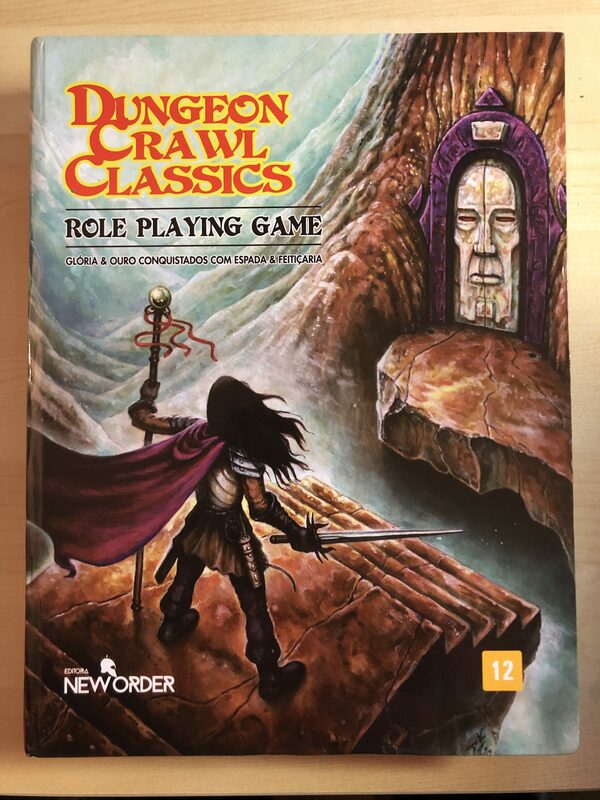 DCC RPG has been licensed for translation in four foreign languages, of which two have been printed so far. True collectors, do you own these? Portuguese (Brazilian) Editions. Published by New Order Editora. There are four cover variations: “blue art,” Jeff Easley cover, Peter Mullen cover, wizard cover, and demon skull cover. 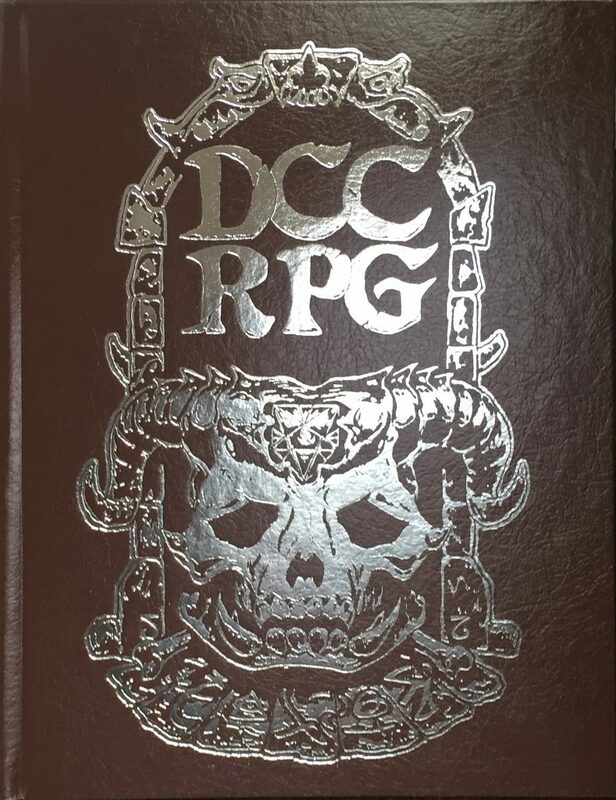 The spines read “DCC RPG” with a helmet icon above.